When you get a new computer, the first thing you probably do is try to find and install all the software you used to use on your old computer. That usually means a lot of mouse clicks and waiting, but there is, of course, an easier way. If you happen to be an open-source fanatic running Windows, WinLibre will greatly simplify the task of outfitting your new computer with a comprehensive software suite that covers office productivity, graphics design, security, and the Internet. 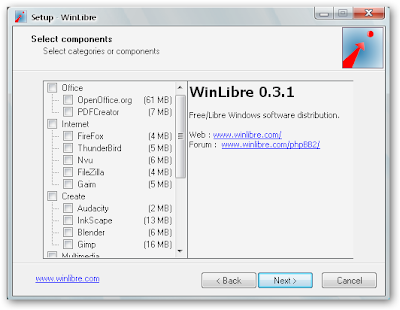 The slim 151 MB WinLibre package contains software like OpenOffice, Gimp, Firefox, and VideoLan along with 16 other handy utilities. Almost any commonly used open source software you can think of is already pre-packaged. If you want to cherry-pick your downloads, there's also a small, 600 KB downloader that lets you customize your installation. This is especially useful if you've already installed some of the software in the complete WinLibre package. After that, it's just a one-click installation, and you'll be ready to go. The actual amount of time you focus on installing software is probably less than five minutes. For Mac users, MacLibre is the corresponding package to WinLibre you'll want to download. It contains a similar set of software that works on Macs.